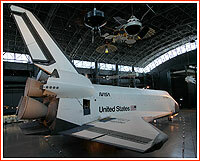 On April 27, 2012, the Space Shuttle Enterprise flew its last mission on top of the Boeing 747 carrier aircraft to become a museum exhibit in New York. The Enterprise was an early prototype of the winged orbiter designed to test the capability of the Shuttle to land as a glider without help of propulsion. 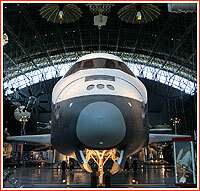 In 1977, the Enterprise piloted by professional astronauts made several risky landings following a separation in mid-air from its carrier aircraft. 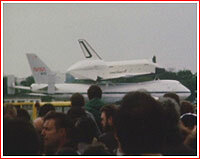 Even though I am weary of most symbolic events and organized public spectacles, I could not resist going to the Jersey shore that Friday in April 2012 to see a highly advertised "last flight" of the Space Shuttle Enterprise over the New York City. Probably every local media report on the event repeated a cliché about this "bitter-sweet" moment, even though nobody was able to explain what the "sweet" part was. The weather was fittingly uncertain whether to celebrate or to mourn on this day, with sunlight trying hopelessly to break through grim low clouds. 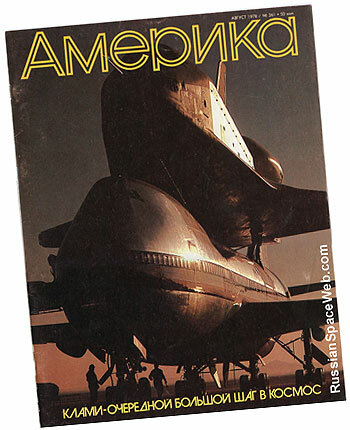 As I stood in blistering wind, I remembered my time in the middle school in Moscow in 1978, when my father brought a hard-to-find issue of the Amerika magazine with a cover photo of the Shuttle Enterprise sitting on top of a giant Boeing 747 basking in the evening sun in the California desert. 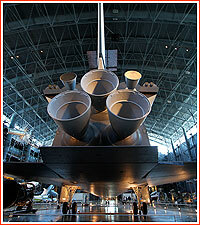 The accompanying article promised the coming of the new era in space flight, exciting and inspiring for any teenager. At the time, I could not imagine that the drama of space exploration would light up my entire life, and I could not guess that decades later, I will watch this incredible machine flying its last mission. Much like I was more than 30 years ago, most school kids who surrounded me on the banks of the Hudson River on this cool morning, were cheering and screaming with excitement, as the Enterprise flew magnificently right above our heads and slowly disappeared above the equally grand necklace of the Verrazano Bridge. However, I could not help but think that while I saw the image of this ship for the first time with the hope for a coming decade of exploration and expansion of humanity into the unknown, those kids had to witness the demise of this very hope, with nothing even closely comparable appearing on magazine covers.